Very good points Mark. Passivhaus does actually make explicit the relationship between volume & surface area, known as the a/v ratio. It also makes explicit the relationship between surface area and usable (or heated) floor area, known as the heat loss form factor (more on that here: http://elrondburrell.com/blog/passivhaus-heatloss-formfactor/). However I agree that it isn't talked about enough by aficionados, particularly as the form factor is an opportunity for architects & designers to have a big impact with a key element of design: the form. There are quite a few passivhaus bungalows around - just not so many in the UK or Europe! Oh I also wanted to add - I'm not aware of m(any) people making the claim that a passivhaus single family dwelling can be delivered for the same cost as an equivalent sized building regulations minimum dwelling? At larger scale, or multiunit housing, schools, commercial building etc, I would argue, as I know others do also, that cost parity for passivhaus or building regs minimum for the same size is achievable. Larger buildings benefit from a reduction in mechanical services requirements (heating & ventilation) and other cost savings can be made through good design & simplification. The key is to design with the end goal in mind from the start - IE achieving passivhaus certification in this case. This focuses the mind and the money on the critical priorities so the budget is spent where needed. 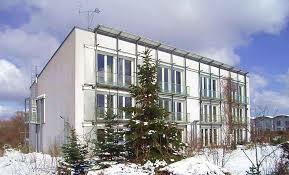 Even so, you could make the argument that having developed a passivhaus compliant design, the windows, for example, could be substituted out for cheaper lower performance windows to demonstrate it would be cheaper not to achieve passivhaus. All that said, in other places it is different. Building regulations compliance in Ireland for example is rather costly now following 'conventional' approaches and it has been demonstrated that it is cheaper to achieve passivhaus (& therefore building regulations) instead. The previous Passive House Plus magazine had several articles on this topic including a case study with a good level of detail. http://www.passivhausprojekte.de/index.php?lang=en, including this large certified PH build by Chris Brookman http://www.backtoearth.co.uk/case-study/silverton-passive-house-devon. That assumes you have a similar area of fenestration, which may be a fair assumption. But do windows account for half of all the heat loss in a PH? It wouldn't surprise me - windows are always a factor of several worse than the rest of the fabric (0.7 vs 0.1 is typical). So they don't have to be that big to account for half the heat loss.